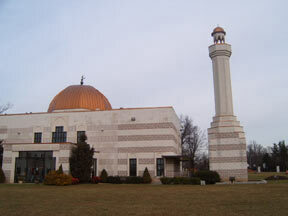 "Islam" Does not Mean "Terrerism"
This is a picture of the Islamic Center in Silver Spring,Maryland. Muslim call it the MCC(muslim community Center). Do you want to know about Islam? Since September 11, 2001 many people became to think that the people who believe in Islam are terrorists like Osama bin Laden. I am an exchange student from Egypt. One sad situation happened to one of my exchange student friends who is Muslim from Indonesia. Her name is Muti and she is a Muslim who covers her hair. Muti was walking with my host family and me in the Metro station and she took a picture of the Metro. There was a man who took her to the police station in the Metro saying that she was a terrorist because she was a Muslim and she took a picture in the Metro station. So, I want to tell you about this religion because I’m one of the people who believes in Islam and my friends and I and most Muslims are not terrorists. What is the meaning of Islam? Why does Islam seem like a different religion? Muslims believe that the Qur’an contains information about many things that happened and many other things that will happen in our life. There are many people from Europe and Asia who convert to Islam. And most of northern Africa is Muslim. Islam is a great, strong religion, and Muslims believe that there are some sacred things in Islam. One of them is called El Share’a. It’s the Islamic rules and Muslims should follow the Share’a because it’s from God. Many Muslim countries follow the Share’a and do it completely like Saudi Arabia. Also there are Muslim countries that follow the Share’a but not completely like Egypt. One of the rules in Share’a says that if a person kills another person intentionally, the government should kill the killer. But if he/she kills the other person unintentionally the government should give him/her a choice. The choice is he should pay money to the dead person’s family or if he will not pay money, he would go to jail. Also the Share’a says that if a person steals something, the Share’a says cut off his/her hand except if the person stole because he/she doesn’t have money for eating. If the person who stole doesn’t have money, the government will feed the person who stole, but the person must go to jail. But this rule changed in Egypt and they put the person who stole into the jail directly without cutting off anything. The Share’a says that a Muslim woman should cover all her body except her face and her hands. There are some Muslim people who believe that a woman should cover her face and her hands too. When the foreign people from different countries like America see the Muslim women who cover their hair, they think that these people are different. Also when American women who do not cover their hair or their bodies go to Muslim countries, the people in the Muslim countries would think that these women are different. But most of the Muslim people don’t have a negative reaction. Who are the terrorists? What did the Prophet Mohamed say about fighting? As there are good Muslims who understand Islam correctly, also there are bad Muslims who understand Islam in a wrong way. As in any other religions there are good people and bad people. After 9/11/2001 people in America heard that the people who destroyed the buildings were Muslims and were led by Osama bin Laden. Unfortunately, many Americans think that all Muslims are like Osama bin Laden and many of them begin to hate Muslims who didn’t do anything. The prophet Mohamed said that men cannot kill any innocent people, and Muslims follow a religion of peace, mercy, and forgiveness. If any individual Muslim were to commit an act of terrorism this person would be guilty of violating the laws of Islam. It's common for some Muslim Women to cover thier hair with head scarves called Hejab. 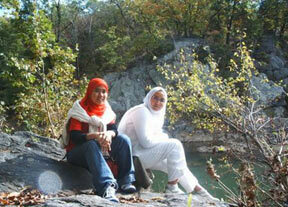 These are two exchange students,Wafa who is from Egypt and Yuli who is from Indonesia.